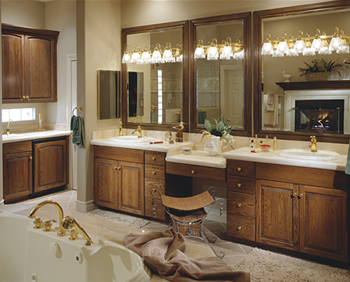 Bathroom Remodeling - Tubs, Showers, Cabinets, Countertops, Marble Flooring - McClincy's Seattle, Bellevue, Renton, Washington. Imagine stepping into your new bathroom – more like a luxurious spa, than .. well, you know. Imagine the new heated marble floors, the relaxing and invigorating shower and steam sauna with fashionable glass doors and marble walls, the oversized tub with pulsating jets to soothe your tired muscles, the heated towel rack, the 3-way lighted mirror, a vanity with a place to sit down to apply your makeup, extra storage for linens and things. Wonderful! Viewing pictures of what you want your bathroom remodel to look like can be helpful, but being able to see it in person is so much better! That's why McClincy's maintains a conveniently-located showroom in the Seattle area – in Renton Highlands, where you can experience firsthand samples of the materials, textures, and finishes that will go into your bathroom remodel project. Visit our showroom today see for yourself and to get a complimentary remodeling consultation! 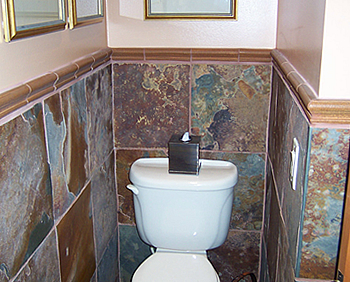 If you or a family member are elderly or have handicaps, you may have a need for special bathroom fixtures, such as handles, walk in shower stalls, raised or lowered sinks, and more. Tell us about your situation and the experts at McClincy's will know exactly what to do. Through the decades we've been in business, we've worked with lots of customers just like you. We'll make your bathroom a place you can relax and refresh no matter your situation. That New Bathroom – Part of Your Dream Home – Can Be Yours! No matter how much time you spend in it, every room in your home has the potential to enhance your living experience. Call on McClincy's expertise in "design and build" to transform your bathroom from simple and functional to simply fabulous. Rely on our decades of design and construction experience to give you a finished project that will exceed your expectations. You can also depend on us for a project design that will save you money without cutting corners on quality.